But for the single dad who’s her closest neighbor, simple holiday decorations just won’t do. Kyle Mattox is determined to give his five-year-old daughter the best Christmas ever—one that includes an outdoor display lit with fifty thousand lights, activated in time to music shared through four giant loudspeakers. When Lanie comes to complain that she can’t write with the lights flashing and carols blasting, Kyle realizes that—unknown to her—their circuits have crossed in the past. If he wants his daughter happy, he needs to keep that information to himself, keep the show running, and keep his distance from Lanie. Note: This companion novella fits well at any point in the series. The last thing Lanie Phillips needed to hear was Christmas music. She jabbed the button of her car radio and cut off a chorus of elves singing “The Most Wonderful Time of the Year.” Wonderful? Not likely, considering she’d be spending it alone. The wail of the wind intensified, and her headlights reflected off pellets of snow that whipped across her line of sight. She pulled her wool scarf higher around her neck. Even with the car’s heat on high, the cold seeped in. She squinted through the squall of white, wishing for some indication that she was nearing the Mattox place. Finding her way down the county roads outside her hometown of Abundance, Missouri, was bad enough in the dark without adding a snowstorm into the mix. Around the next bend, a small sign barely stuck out over the snow. “You’re almost to the Mattox house!” it read. She gave a silent cheer. Hand-painted holly leaves and candy canes curled around the red and green lettering. Maybe Kelly, her boss, had been planning a big Christmas party. Whatever the reason for the sign, Lanie would take any help she could get to find the right house. Kelly Mattox must have had some party in the works. Lanie could only imagine how flustered her boss must have been, canceling a party and leaving town unexpectedly. Up ahead a mailbox read “Mattox” in reflective, stick-on letters. “Finally.” Lanie turned into a snow-covered gravel drive. To her right a small house sat close to the county road. Her destination was farther back, the two-story farmhouse at the end of the drive. A tall figure jogged toward her, and the skin tightened at the base of Lanie’s scalp. She had no intention of making the headlines. No plans to star in “Missouri Art Teacher Murdered While Pet-Sitting for Principal.” She locked her doors and kept driving. The figure waved, and a man’s face, now illuminated by a flashlight, appeared near her window. He shouted something. Did he say her name? Lanie eased to a stop and lowered her window. Oh. Her boss’s nephew. He should be safe. And he sounded friendly, with a hint of the northeast in his voice. “Lanie Phillips. Pet-sitter.” She stuck out a mittened hand. He gave it an enthusiastic shake. Kyle was tall and thin, from what she could tell under his bulky red ski jacket, and he had wavy brown hair and a narrow face. His mouth quirked to one side like he was on the verge of a chuckle, and his eyes were the color of dark-roast coffee. Lanie could see kindness in them and a resemblance to her boss. She drew back her hand—perhaps a second later than she would have if she hadn’t been staring at his knit cap. And its foot-long antlers. This was her straight-laced principal’s nephew? Lanie glanced toward the cottage, then looked back at his cap and counted five jingle bells on each antler. “Man, I bet Aunt Kelly gave you three pages of typed instructions.” Kyle shook his head slightly, as if Kelly was lovable but a bit loony. “Actually, it was four.” Lanie couldn’t keep the amusement out of her voice. Even though the chocolate lab was pregnant, Kelly had gone a little overboard. Lanie really didn’t need all those instructions, as she had often helped her grandfather, a veterinarian, when she was younger. She gave a rueful smile and moved a finger toward the power window button. The wind gusts were freezing, scattering snow over her face and the inside of her car. “Daddy?” A young girl who looked like she was in kindergarten or first grade peeked out the back door of the cottage. “Light show?” She released the control, leaving the window halfway up. Judging from Kyle’s tone, this was an honor akin to lighting the Christmas tree at Rockefeller Center. If Kelly had mentioned it, Lanie would have stayed at her apartment and told her boss to find another pet-sitter. A bunch of cars going up and down the county road, honking at each other, did not sound like the perfect writing retreat Kelly had promised. But being somewhere different for the holidays, even just across town, had sounded good, like it might take her mind off things. Because Christmas was wonderful, but . . . not always. Not six years ago. And not this year. Friends had invited her to spend the break with them, or just to come over for the big day, but she’d declined. She knew herself too well, knew she’d feel horribly awkward. Halfway up the drive, a trio of snowmen, each about eight feet tall and outlined in white lights, came alive and danced from side to side in rhythm to some unheard melody. “Thought I’d fixed it.” Kyle’s voice held a note of pride. “Oh, they’re cute,” Lanie said. Not worth driving seven miles out of town in the middle of winter to see, but festive. “That’s nothing.” Kyle turned toward the cottage. “Flip the big switch, sweetheart,” he yelled. Behind him, eight reindeer began flashing, two by two. “Rudolph, the Red-Nosed Reindeer,” performed by some ’40s crooner, blasted from speakers in the yard. Lanie cringed at the sound, then followed the flashing lights, glancing from the reindeer on one side of the drive to a ten-foot Santa on the other, as if watching an electronic tennis match. She stared, mouth dry, until “Rudolph” ended and Santa and the reindeer went dark. An off-key rendition of “Deck the Halls” screeched from the speakers. A circle of Christmas trees formed from lights and wire began flashing, one after another, in a pulsating, nauseating spiral, like some out-of-control carnival ride. 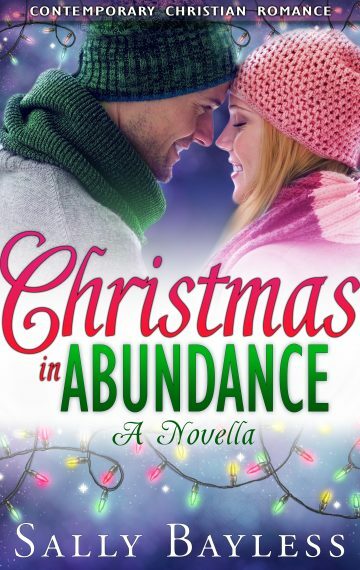 It was Christmas—bigger, louder, and tackier than Lanie had ever imagined. The antithesis of the holidays she was used to—tussling on the carpet with her nephews, sipping cocoa with her mom and sister, and watching her brother-in-law untangle all-white lights for a real tree. Lanie turned back to Kyle and blinked, still seeing halos where her retinas spasmed from the lights. Even the first few notes of some holiday songs made her chest ache. And then there was the noise—the show completely short-circuited her plans for a peaceful winter break. How could she write while subjected to this? Lanie opened her mouth, then clamped it shut. “I know, you hardly know what to say, it’s so cool,” Kyle said. Lanie raised her window. The only way this would be cool was if the Mattoxes had a soundproof room in the back of the house. With blackout curtains. Her back teeth pressed together, she gave a short wave and drove toward the farmhouse. Kelly probably had her hands full watching her twin two-year-old grandsons while her pregnant daughter was in the hospital. Lanie didn’t want to make things harder. She knew how medical issues could be overwhelming—she’d been there when Mom had gotten sick. But she had to finish her thesis before the break ended or she wouldn’t be graduating. She couldn’t take the dog to her apartment. And she couldn’t work here. First thing in the morning, she would send a text to her boss and gracefully bow out of this nightmare. Surely Kelly could find some other dog lover who would appreciate Christmas on steroids.